Warehouse floors don’t have to be glamorous, but they do need to be sturdy and safe. Cracks in the concrete, spills, and moisture can cause hazards for employees, vendors, and visitors. The ideal warehouse floor is one that you don’t have to think about, one that is durable and provides a safe and sturdy surface on which to work. At Prestige Floor Coating, we provide professional floor refinishing services in the Baltimore area. To schedule industrial floor refinishing services or warehouse floor coatings in Baltimore, call our team at (443) 519-2628 or contact us online. At Prestige Floor Coating we have designed a proprietary floor coating epoxy with warehouse floors in mind. Designed specifically for east coast concrete, our floor coating polymer is guaranteed to protect your warehouse floor from heavy use and harsh conditions. Whether you need industrial floor refinishing services or to upgrade your floors with professional floor coatings, the materials we use are made to handle anything your business can dish out. Strong, yet environmentally safe floor coatings are the result of years of research and tried and true results, by our own chemists. To schedule professional warehouse floor coating services in Baltimore, call (443) 519-2628 or contact us online! We employ our own in-house chemists and produce our own floor coating product, so we know that’s it’s designed to do what we say it will do. In fact, we’re so sure of our warehouse floor coating that we offer a two-year warranty on every floor. In the unlikely event that your warehouse floor coating starts to peel or flake during that time, we’ll replace the entire floor. To schedule industrial floor refinishing or warehouse floor coating services in Baltimore, call our team at (443) 519-2628 or contact us online. A floor using warehouse floor coating by Prestige Floor Coating is easy to maintain and clean. It’s virtually impenetrable, so it doesn’t stain and can be cleaned by hosing it off or cleaning with a wet mop. Our warehouse floor coating is made to last. A warehouse floor treated with our floor coatings is a floor won’t need to be replaced for decades. Prestige Floor Coating has been helping business owners create safe and durable floors in warehouses and other spaces for more than 16 years. Over that time, we have helped more than 40,000 customers and applied more than 30 million square feet of floor coating material. Suffice it to say: we know a lot about industrial floor refinishing services and high-quality floor coatings! We employ our own chemists and we design and produce our own coating product. 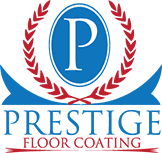 To learn more about how Prestige Floor Coating can help your Baltimore, MD business with its flooring needs, call us at (443) 519-2628!